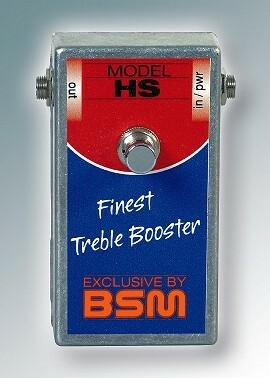 Der BSM HS Treble Booster basiert auf dem legendären Hornby-Skewes Treble Booster von 1967, ist mit den Original NOS Germanium Transistoren ausgestattet und wurde zu seiner Zeit gespielt von unzähligen Gitarristen, in erster Linie aber bekannt durch Ritchie Blackmore. Konzipiert für induktionsschwache Single Coil Pickups, produziert er einen kraftvollen, bissigen und durchsetzungsfähigen Sound, der half, z.B. "Deep Purple In Rock" und "Fireball" so brilliant klingen zu lassen. Er tönt kräftig-dunkel und etwas fuzzy, vor allem im Bass-Bereich liefert er den hohlen Sound eines halb geöffneten Wah-Wah. Almost all British rock guitarists using single coil pickup guitars used a germanium Treble Booster from the late 60's to the mid 70's. By the end of the seventies, the Treble Booster was replaced by a new circuit from Japan, the so called Tube Screamer and other similar overdrive circuits. These were based on the old Treble Boosters and therefore had a very similar frequency response. The germanium boosters on the other hand, sadly fell into oblivion despite their unique and inimitable sound. The HS Treble Booster has been specifically designed for single coil pickups with a relatively low coil inductance, such as pickups in Fender, Rickenbacker, Burns or Vox guitars. On these pickups, the HS produces (with the volume control of the guitar turned up to the max) a fat, biting and penetrating lead sound, minus any shrill characteristics. By lowering the guitar's volume control, many shades of crunch can be easily dialed in. Another thing to consider is that when a guitar amp's volume is turned up (reaching saturation), the power amp normally begins to mute the highs, which results in a duller sound. At an amp's full tilt, the HS Treble Booster allows a more transparent tone (covering the entire frequency range) to shine through. 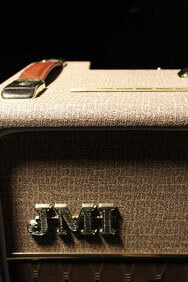 The presence control on the amp need only be minimally used (if at all). When vintage amps are used (such as the Fender Deluxe, Fender Bassman, Vox AC30, plexi Marshall 100w or Marshall Major) it is amazing what effect the use of a good treble booster has. It is also of interest to note that Ritchie Blackmore used modded Marshall Major 200 heads and played on "Made In Japan" with the following settings: Presence 0; Bass4; Middle 5; Treble 6-7; Volume 7-8.